Those that have endured my ramblings over a long period of time, know that I am a cowgirl by choice, having fallen so deeply in love with a cowboy when I was only six years old. Not that he wasn’t flawed, I am sure he was, but he loved me fiercely. I knew that once he said it, I could bank on it. He worked hard and played hard, and there was something about that, that spoke to me. His handshake was better than any legal document and his commitment to his animals and his land was not something that someone had to require of him, but rather a responsibility that pulsed from deep inside of him. A God given mandate that he knew and honored. I love being out in the wide open range, breathing in the crisp air, hearing the cattle bellow in the background as the horses ears are on point watching their every move. NO words are needed…. as the cow dogs move the “doggies” on home. There is a oneness the rancher has with the land, one that perhaps Washington can never truly understand. 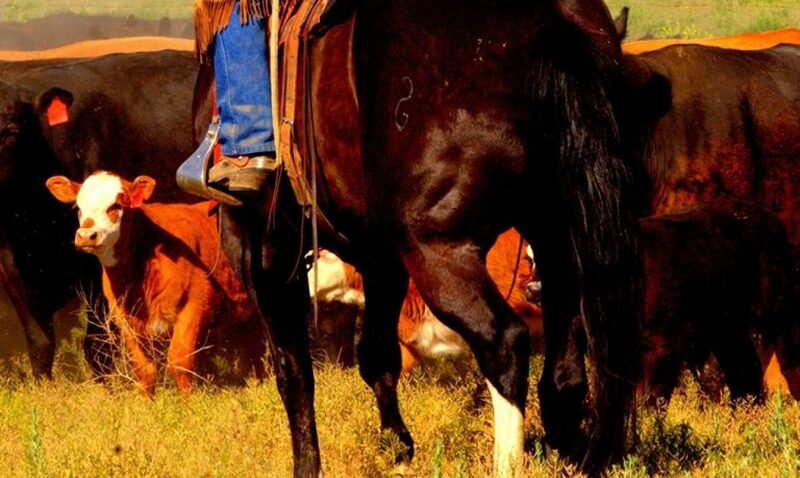 A oneness that is stronger than any contract – it is a knowing that if the rancher takes care of the land, the land will take care of the rancher. They need each other and their agreement has held over the passage of time. As I have wrestled with issue of farming and ranching and listened to the horrible things that we do and say to one another as we try and defend our solidly held positions on such matters, I wonder how far it would go if we could just get lawmakers on the back of the horse pushing cows for miles, what would it change if he could see the grass lands first hand, or the rancher as he dismounts time and time again to closely examine the ground – being able to spot a new “weed” or some other invasion from his saddle. I wonder what it would change if they first handily saw the wildflowers soaking up the sun, or the reed grasses as they sang their songs. I wonder if they, would dismount too as the rancher stops to repair a fallen post, or if he would yell “giddy up” to race back to gather the little ones who have somehow fallen behind. I wonder what they would do, those visitors from the capital when after a long ride they learned the day wasn’t over, there were still horses to care for, and chores to do, and…. would they then see that the land is in good hands? And in the morning, when the rancher is up before the rooster tending once again to the chores, and putting on the coffee. As they arise stiff and sore and exhausted, overwhelmed to know today is a new day, and we get to do it all over again.. would they? As they sit down to breakfast of eggs and bacon and toast and witness the rancher bow his head and give thanks for the provisions and blessing to live this life.. would it change how they make laws and carry them out? Breaking the law, and being hateful with each other isn’t the answer when it comes to politics and ranching.. sad that some thing that is the measures we have to go to in order to be heard. Perhaps since that didn’t work, we just start inviting our leaders to come gather cows with us. Let them experience it first hand. And once they too have fallen in love with the west, I wonder if they too will do what is right, or even be a cowboy by choice. I was raised on a dairy farm for the first 19 years of my life. In some ways I’m still a farmboy. I can relate to your writing, I still love the farm, the early mornings, the smell of freshly cut hay, or a newly plowed field. More people need to experience the values that this instilled in us at such early age, values of worth, hard work, respect for the priviledge of being a land owner. Actually, no one is a land owner, we simply work the ground for a number of years, we prepare the ground, sow the seeds, our dear Father brings the sun & rain, soon life springs forth, it’s a miracle of life. We have the privilege of being stewards of God’s good earth. In turn, he has given us Himself and eternity. What more could we ask for, we may seem to grow older as the years pass ……… but in reality, life has just begun.